One of the hottest topics of conversation on and off the Internet is about the Economic Stimulus Rebate checks being mailed out. Everyone wants to know when they will receive their payout and what they plan to do with the funds. Some people have already received their rebates and have either used them to actually stimulate the economy by making a purchase they would not have normally made. Others have done what I would do and just stick it in my savings account. Unfortunately, now I'll be using it to make up the shortage in my mortgage escrow account. I've heard some people saying they will use it to start a savings account. It's great that they will be actually be using the money to save for future needs and not blow it. It's important to have money to fall back on in those lean months. If you are using your stimulus check to start your savings, that's great. If you already have a fully funded savings account, that's great too. 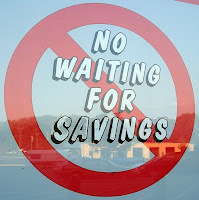 You don't have to wait for an economic stimulus check to give your savings account a boost. There are numerous ways to find a little extra money in your monthly budget. Every little bit helps. It can be $5 or $50 but with regular savings, the amounts add up. Where will you get the extra money to add to your monthly savings? Adjust your W4. Are you paying too much in federal taxes? If you get a large tax refund every year, you are probably giving the government too much money. Adjust your federal withholding and put extra money in your pocket with each paycheck. Check out the withholding calculator at the IRS website. Take Advantage of Free Money. If you haven't signed up at Revolution Money Exchange, you should definitely consider it. RME is like Paypal but without the fees. Right now, they are offering $25 just for opening an account. It takes less than five minutes to sign up, doesn't cost anything and the bonus is instant. If you want to open a new savings account instead, consider using ING Direct, you get a $25 bonus when you open a new account with at least $250. If you want to get a little extra money from your everyday purchases, consider opening a Upromise account. Upromise contributes a percentage of your purchase to a college savings account when you shop at participating stores or buy participating products. Anyone can open an account whether you have kids or not. If you don't want to use the savings for college, you can withdraw the funds from the account for free. Have a little extra time on your hands? Consider signing up for survey sites like Mypoints where you are paid to take surveys, shop online, etc. Save Money on Expenses. Do you really need all the premium channels in your cable package? Do you need home phone service and cell phone service? Can you reduce your cell phone to a lower plan? Do you pay too much for insurance? Take a few minutes to get quotes from multiple auto and home insurance companies to see what you can save. InsureMe.com is a great place to get multiple free quotes. Those are just a few ideas of how to save extra money to boost your savings each month. There are a gazillion other ways to save money each month. Do a simple search for "saving money" on Google and you will get hundreds of ideas to save money. I talked to a group of college kids a few weeks ago and told them that saving a little bit automatically every week starting with their first job was a really smart thing to do. (They were very concerned with liking their first job). I told them that if they saved up some money, they would have it in reserve if they ever did want to change jobs, move, etc. I wish I would have started saving earlier, that's for sure! as a free market economist, I should point out that saving money (it would be ideal to invest in the stock market) is a better long term solution for the economy than frivolously spending the money. In any event, congratulations on considerable debt reduction since I've first started following your blog. I, for one, will be using the extra cash to buy myself a month's rent. The cost of living these days is ridiculous, especially in the NY metro area.